Objective: To evaluate a pharmacist-conducted educational and monitoring programme, designed to promote dietary and lifestyle modification and compliance with lipid-lowering drug therapy, for patients with dyslipidaemia. Methods: This was a prospective, randomized, controlled study. 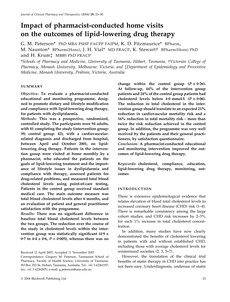 The participants were 94 adults, with 81 completing the study (intervention group: 39; control group: 42), with a cardiovascular-related diagnosis and discharged from hospital, between April and October 2001, on lipid-lowering drug therapy. Patients in the intervention group were visited at home monthly by a pharmacist, who educated the patients on the goals of lipid-lowering treatment and the importance of lifestyle issues in dyslipidaemia and compliance with therapy, assessed patients for drug-related problems, and measured total blood cholesterol levels using point-of-care testing. Patients in the control group received standard medical care. The main outcome measure was total blood cholesterol levels after 6 months, and an evaluation of patient and general practitioner satisfaction with the programme. Results: There was no significant difference in baseline total blood cholesterol levels between the two groups. The reduction over the course of the study in cholesterol levels within the intervention group was statistically significant (4�񵩛 to 4�� 0� P < 0�5), whereas there was no change within the control group (P = 0�). At follow-up, 44% of the intervention group patients and 24% of the control group patients had cholesterol levels below 4�mmol/L (P = 0�). The reduction in total cholesterol in the intervention group should translate to an expected 21% reduction in cardiovascular mortality risk and a 16% reduction in total mortality risk � more than twice the risk reduction achieved in the control group. In addition, the programme was very well received by the patients and their general practitioners, by satisfaction questionnaire.Conclusion: A pharmacist-conducted educational and monitoring intervention improved the outcomes of lipid-lowering drug therapy.